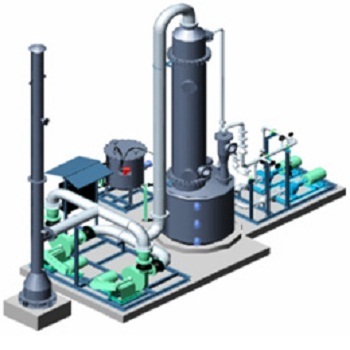 We are offering an extensive range of super quality Scrubbing Systems to our clients. We offers Venturi and Packed Tower Absorbers for removal of gaseous pollutants such as Cl2, ClO2, HCl, SO2, NH3, NOx, H2S, mercaptans, amines. The system can be either combination of venturi and packed tower or can be individual absorbers. In venturi scrubber, the gaseous stream gets sucked using venturi from the source where it comes in contact with scrubbing liquid. Any particulate matters gets removed at this stage. A high pressure pump is required to generate the suction for the gaseous stream. In packed tower, the gaseous stream flows upward through a packed bed while the scrubbing liquid flows downward by gravity over the packing. Packed bed consists of random or high performance packing which provides a close gas-liquid contact. The internal components of the tower consist of a packing support plate, a packed bed, a liquid distributor and a mist eliminator. Packed tower absorbers operate at relatively low pressure drops and handle high circulation rates of scrubbing liquid. The tower can be designed for once through operation or to recycle the liquid, depending on the process requirement. Venturi & Packed tower absorbers are available in alloy steel, PP / FRP and rubber lined mild steel. The tower internals can be made from polypropylene or any other materials including metals depending on the process conditions. A team of expert chemical engineers is available for process design, detail engineering, installation & commissioning. Trans Tech Projects Pvt. Ltd. was established in the year 1999. It is promoted by US graduates and offers a wide range of services such as Project Management, Detail Engineering, Design & Drafting, Automation & Control. We have served various domains such as Waste Water & Water Treatment, Distillation, Lube Oil Re Refining, Biodiesel, Fume Extraction & Scrubbing, Adsorption, Reverse Osmosis, Motion Control & Material Handling, Pilot Plants, Special Purpose Machines, Building Automation & Machine Automation. We are an ISO 9001 certified company, and have elaborate procedures for project execution, and testing to meet international quality standards. Our team of 75 qualified professionals has a blend of Engineers, Programmers, Designers and CAD Operators in various disciplines. We are engaged in manufacturing, supplying & exporting a wide gamut of products includes Scrubbing System, Columns Internal & Control Panels. We believe in long-term relationships with our clients where we work as a cost effective satellite office. We consistently thrive to deliver quality output, stick to project schedules, and always offer very competitive rates. Our Offshore Model has proven to be a cost effective for our satisfied clients all around the world! We have served clients in North America, Europe, Australia, Singapore, Malaysia, Hong Kong and Middle East.